left and right axis drift is easy to see with a string line down the top of the gun . start in between the front sight ears to a small mark in the center of the rear buffer mount area. don't trust that the rivets on top for the buffer lugs are exactly centered. up and down axis drift is harder to gauge but the same string line method is still the best IMHO. also if you make a perfectly vertical line on a wall and carry it out slightly on the floor you'll be able to set the receiver down upright on its buffer area , check with a level sitting on top if its square ( if the floor is ), and stand back and look to see if its plumb ,turn it 90 degrees to check both axis. Last edited by drooling idiot on Sat Jan 06, 2007 3:26 pm, edited 3 times in total. - The receiver doesn't have to be "perfect" - so long as the cover latches and the barrel bushing doesn't bind, you should be OK.
- Use fishing line and you can plumb the centerline, spot weld, and instantly check if it warps. - Use the top cover and bolt the rails into place to set the rear piece's height and you can clamp the whole rear in a vise and spot weld it. - Use the barrel to set the front piece's center, and the fishing line. All that together and you can spot weld it into place. - Expect to have to cut and reweld the spot welds, as they will creep on you a little bit. jbaum wrote: I don't know if this measurement is posted anywhere... I looked briefly and didn't find it. This dimension is listed in a section about replacing the Cam Piece in the MG42 armorer's manual I'm working on. I checked the dimension on my MG42 original (never welded) receiver and it's accurate. 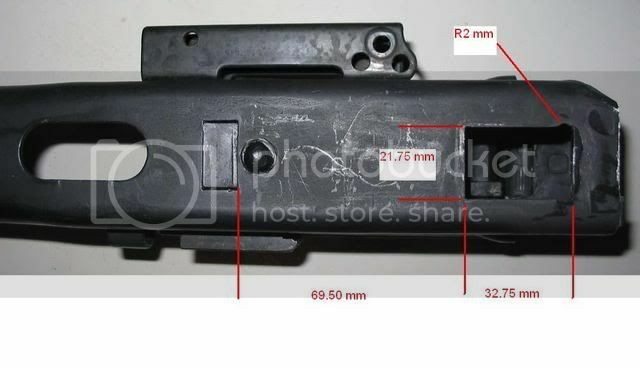 The distance from the rear edge of the receiver (buttstock end, with stock and base piece removed) to the rear of the rectangular openings where the ramps of the cam piece stick into the receiver = 382 mm. The spec says it can be short by 0.2 mm. I thought that'd be a good measurement to have when welding up those receiver pieces. What do you mean by "light" and "heavy" on the receiver measurements? The 42 has a mix of english and metric measurements. The reciever OAL is generally between 37 9/16" to 37 5/8". But there is variations with all sheetmetal stampings. I checked my M53 FA receiver length and it measured, as close as can tell, 37 5/8". The gun shoots well but will not fit the cradle of my new MG3 ground mount tripod. The mg3 ground tripod mounting points are to close together by about an eighth of an inch or less. It fits my Yugo ground tripod WW2 copy perfectly. Are the specifications different between the two mounts or do you think my receiver might be two short, or the mount out of spec? I welded the cut m53 receiver several years ago to specifications I found at that time. The mounting brackets on the receiver is 16" apart. Just a quick update. The MG3 recoil tubes were bent slightly but is now fixed. The gun fits both tripod cradles fine.